Van Allen Clinton McCoy (January 6, 1940 – July 6, 1979) was an American musician, record producer, arranger, songwriter, singer and orchestra conductor. He is known best for his 1975 internationally successful song "The Hustle". He has approximately 700 song copyrights to his credit, and is also noted for producing songs for such recording artists as Gladys Knight & the Pips, The Stylistics, Aretha Franklin, Brenda & the Tabulations, David Ruffin, Peaches & Herb and Stacy Lattisaw. Van McCoy was born in Washington, D.C., the second child of Norman S. McCoy, Sr. and Lillian Ray. He learned to play piano at a young age and sang with the Metropolitan Baptist Church choir as a youngster. By the age of 12, he had begun writing his own songs, in addition to performing in local amateur shows alongside his older brother, Norman Jr. The two brothers formed a doo-wop combo named the Starlighters with two friends while in T. Roosevelt High School. In 1956 they recorded a single entitled, "The Birdland", a novelty dance record. It gained some interest, resulting in a tour with drummer Vi Burnsides. In 1959 the Starlighters produced three singles for End Records that included "I Cried". Marriage and other commitments eventually caused the group to disband during the mid-1950s. Van also sang with a group called the Marylanders. During 1961, McCoy met Kendra Spotswood (also known as Sandi Sheldon) who lived near his family. For the next five years, they sang and recorded music together professionally. Their relationship ended when McCoy delayed their wedding plans because of a work contract he had signed with Columbia Records. In September 1958, McCoy entered Howard University to study psychology but dropped out after two years to relocate to Philadelphia, where he formed his own recording company, Rockin' Records, releasing his first single, "Hey Mr. DJ," in 1959. This single gained the attention of Scepter Records owner Florence Greenberg, who hired McCoy as a staff writer and A&R representative for the label. As a writer there, McCoy composed his first success, "Stop the Music," for the popular female vocal group, The Shirelles in 1962. He was co-owner of Vando Records with Philly D.J. Jocko Henderson. He owned Share label and co-owned the Maxx label in the mid-1960s, supervising such artists as Gladys Knight & The Pips, Chris Bartley and The Ad Libs. He really came into his own after first working for top producers Jerry Leiber and Mike Stoller as a writer and then signing with the major April-Blackwood music publishing concern, connected with Columbia Records. McCoy went on to write a string of hits as the 1960s progressed. He penned "Giving Up" for Gladys Knight & the Pips (later a hit for both The Ad Libs and Donny Hathaway), "The Sweetest Thing This Side of Heaven" for Chris Bartley, "When You're Young and in Love" for Ruby & the Romantics (later a hit for The Marvelettes), "Right on the Tip of My Tongue" for Brenda & the Tabulations, "Baby I'm Yours" for Barbara Lewis, "Getting Mighty Crowded" for Betty Everett, "Abracadabra" for Erma Franklin, "You're Gonna Make Me Love You" for Sandi Sheldon and "I Get the Sweetest Feeling" for Jackie Wilson. He also put together the hit-making duo of Peaches & Herb, arranging and co-producing their first hit, "Let's Fall in Love," for the Columbia subsidiary Date in 1966. 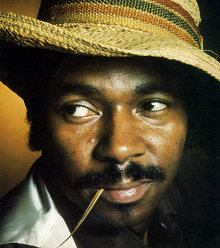 The same year, McCoy recorded a solo LP for Columbia entitled Night Time Is Lonely Time, and, a year later, started his own short-lived label, Vando, as well as his own production company VMP (Van McCoy Productions). Van wrote or produced most consistently for The Presidents ("5-10-15-20 (25 Years of Love)"), The Choice Four ("The Finger Pointers," "Come Down to Earth"), Faith, Hope & Charity ("To Each His Own" and "Life Goes On") and David Ruffin ("Walk Away from Love"). In the early 1970s, McCoy began a long, acclaimed collaboration with songwriter/producer Charles Kipps and arranged several hits for the soul group The Stylistics as well as releasing his own solo LP on the Buddah label, Soul Improvisations, in 1972. The album included a minor hit, "Let Me Down Easy," but it was not a success following poor promotion. Following his success with "The Hustle", it was re-released in abridged form (two songs less) as "From Disco to Love." He formed his own orchestra, Soul City Symphony and, with singers Faith, Hope and Charity, produced several albums and gave many performances. Van McCoy appeared on the Mike Douglas Show and was a regular guest on The Tonight Show. He wrote and sang the theme song for the 1978 movie Sextette that starred Mae West and Timothy Dalton and made a cameo appearance in it, playing a delegate from Africa. He also contributed some music for A Woman Called Moses. Along with Faith Hope & Charity, Brass Construction and Johnny Dark, he appeared in episode 4.20 of Don Kirshner's Rock Concert. In 1975, McCoy released to low expectations the mostly instrumental LP Disco Baby for the Avco (later H&L) label. The title song, "Disco Baby", was written by George David Weiss, Hugo Peretti and Luigi Creatore, and was also performed by The Stylistics for their 1975 album Thank You Baby. Unexpectedly, a single called "The Hustle" from the album, written about the dance of the same name and recorded last for the album, went to the top of both the Billboard pop and R&B charts (also #3 in the UK) and won a Grammy Award. The album was also nominated for a Grammy. McCoy, then regarded as a disco hitmaker, never repeated the success of the song, although the singles "Party", "That's the Joint" and "Change with the Times" got significant airplay. The latter reached #6 in the Billboard R&B chart and was a Top 40 hit in the UK. There were no further major sellers in the US, despite a series of follow-up albums, From Disco to Love (the abridged 1975 reissue of Soul Improvisations), The Disco Kid (1975), The Real McCoy (1976), Rhythms of the World (1976), My Favorite Fantasy (1978), Lonely Dancer (1979) and Sweet Rhythm (1979). However, he scored the UK top 5 again during 1977 with the instrumental success "The Shuffle". which became the theme tune for BBC Radio 4's Sport on Four. McCoy also had success with David Ruffin's comeback album, Who I Am, featuring "Walk Away from Love", (US#9, US#1 R&B) in the US and a UK Top 5 success. He went on to produce the next two albums for Ruffin, which spawned further successes. McCoy produced Gladys Knight & the Pips' Still Together LP, and for Melba Moore ("This Is It" and "Lean on Me"). He discovered Faith, Hope And Charity, whose major success in 1975, "To Each His Own", was another R&B chart-topper. In 1975 he also arranged two of his compositions "My Heart's too Big for my Head" and "You've Got to Tell Her" for the Asha Puthli album She Loves to Hear the Music. McCoy died from a heart attack in Englewood, New Jersey, on July 6, 1979, at the age of 39. He is buried in the McCoy family plot at Lincoln Cemetery, Suitland, Maryland, a suburb of Washington, D.C.
1963: "Never Trust a Friend" / "Mr. DJ"
1963: "It Ain't No Big Thing" / "Love Can Mess Up Your Mind"
1965: "Baby Don't Tease Me" / "Girls are Sentimental"
1966: "I'll Wait for You" / "The House that Love Built"
1967: "To Make My Father Proud (To Make My Mother Smile)" / "Where There's a Heartache (There Must Be a Heart)" / "Did My Baby Turn Bad"
1962: "Follow Your Heart" / "Lonely"
1969: "I Started a Joke" / "Tony's Theme"
1974: "Soul Improvisations (Part 1)" / "Soul Improvisations (Part 2)"
1975: "Change with the Times" / "Good Night, Baby"
1975: "Night Walk" / "Love Child"
1976: "Party" / "The Disco Kid"
1976: "The Shuffle" / "That's the Joint"
1977: "Soul Cha Cha" / "Oriental Boogie"
1978: "My Favorite Fantasy" / "You're So Right for Me"
1979: "Lonely Dancer" / "Decisions"
^ a b c d "The Story of Van McCoy". Van McCoy Music, Inc. Retrieved June 4, 2017. ^ Ankeny, Jason. "Van McCoy Biography". AllMusic. All Media Network. Retrieved June 5, 2017. ^ "Ad Libs Songs". AllMusic. All Media Network. Retrieved June 5, 2017. ^ "Van McCoy Profile". Everything2. Retrieved June 4, 2017. ^ "Van McCoy, 39, Composer of 'The Hustle,' Dies". The Washington Post. July 7, 1979. ^ a b c Roberts, David (2006). British Hit Singles & Albums (19th ed.). London: Guinness World Records Limited. p. 338. ISBN 1-904994-10-5. ^ Eyries, Patrice; Callahan, Mike; Edwards, Dave. "Van McCoy Avco Recordings". Avco Embassy Discography. Retrieved June 4, 2017. ^ "Van McCoy, Composed 'The Hustle,' Hit in '75". The New York Times. July 7, 1979. p. 24. This page is based on the Wikipedia article Van McCoy; it is used under the Creative Commons Attribution-ShareAlike 3.0 Unported License (CC-BY-SA). You may redistribute it, verbatim or modified, providing that you comply with the terms of the CC-BY-SA.